Anywhere along the Okanagan stretch you will find a variety of lifestyles and neighborhoods. Whether education, work or recreational activities bring you to the Okanagan, a rich, flavourful experience is always guaranteed. The Central Okanagan is comprised of five separate areas: Kelowna, Lake Country, Peachland, Westside (including Westbank) and the Joe Rich/Ellison region. All have unique characteristics but are closely interrelated. The Community Profiles provide comprehensive information for each area. Peachland Eleven kilometers of beaches and home to over 5,000 people. The District of Peachland is home to about 5,000 people, some of whose homes are nestled along the community’s eleven kilometers of shoreline. The remainder of more than 2000 households rest on hillsides overlooking Okanagan Lake. Considered a bedroom community, Peachland is just five minutes from Westbank and 20 minutes from Kelowna. Residents, therefore, enjoy the benefits of both a small people-oriented community and a thriving regional center. Westside Affordable housing, abundant recreational opportunities and home to over 30,000 people. Westbank is a popular tourism, industrial and residential area and offers an enticing lifestyle. The area continues to grow at a rapid pace as people relocate from all over the globe to enjoy the quality of life offered. Additional information on the Westside can be found on the Westside’s Regional District website. http://www.regionaldistrict.com/ Kelowna Kelowna is a vibrant community with booming high tech, tourism and wine industries. Kelowna enjoys a lifestyle second to none and has one of the most stable economies in Canada. With a population of approximately 100,000, Kelowna is the Okanagan’s largest community. Kelowna is the retail, education and health care hub for the region, and is home to over 200 high tech businesses and has been ranked the most cost effective place to do business in the Pacific Northwest. Click here for Google Earth Map of neighborhoods within Kelowna. Lake Country Away-from-the-city feel offering the enjoyment of a rural lifestyle. Lake Country is located in the heart of the Okanagan where sun, water, mountains, friendly people and fun all meet. The endless supply of recreation, scenery and quiet country life is home to over 10,000 people. 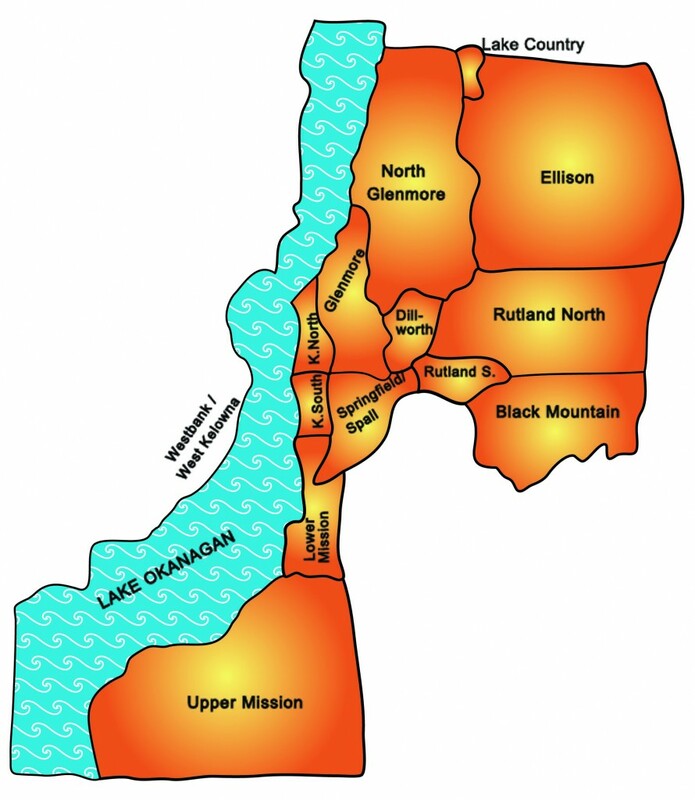 Lake Country is a municipality made up of four different constituencies: Winfield, the commercial centre of the area; Okanagan Centre, a residential community that lines Okanagan Lake; Oyama, located between and around both Wood Lake and Kalamalka Lakes; and Carr's Landing along Okanagan Lake. As the name Lake Country indicates, the area is surrounded by many lakes. The larger lakes are: Okanagan, Kalamalka, Wood, and Duck, while in the hills to the east lie smaller fishing lakes named Beaver, Dee, Aberdeen, Oyama and many more. Central Okanagan East (Joe Rich/Ellison) Known for its natural beauty and open landscape. Joe Rich is ranch country while Ellison is a bedroom community with a country feel. Ellison predates Kelowna as the first major settlement in the area. Among its most desirable new properties are the homes surrounding The Bear and Quail courses at Okanagan Golf Club. Kelowna is the central hub in the Okanagan for major retail and business centers. Virtually every type of retail experience is offered – from boutique specialty stores to franchise chains. Orchard Park Shopping Centre is the largest shopping center between Calgary and Vancouver offering over 150 shops and services. Most chain stores are represented locally including Wal-Mart, Costco, Winners/Home Sense, Home Depot, Pier One, Chapters. Home Outfitters, BCBG & the list continues to grow! Kelowna General Hospital is Kelowna and the Central Okanaga’s primary acute care health facility. It operates 337 beds – 12 intensive care, 8 coronary care, 139 medical, 1 obstetric, 10 pediatric,24 psychiatric, 38 rehabilitation, 88 surgical and 20 nursery. RECREATIONAL ACTIVITIES (Information provided by Invest Kelowna) There are a variety of community services and clubs in the Central Okanagan. Be sure to visit the following websites to learn more about your favorite activities. Kelowna and the rest of the Central Okanagan are known for their hot summers and mild winters. The temperature is best described as being a mild continental type. The summers are warm with hot days but do cool off sometimes in the evenings. Winters, are occasionally cold but much milder than areas north and east of the Valley. In Kelowna the mean maximum temperatures vary from about zero degrees Celsius in January to 27.9 degrees Celsius in July; thus, about one third of mid-summer is tropical in nature. The Okanagan is characterized by cool humid air and cloudy skies in winter, and by dry air with bright skies in summer. The mean annual hours of bright sunshine in Kelowna and the Central Okanagan are just under 2000 hours. Pack Your Bags! Arts and Culture play a large part in Kelowna and the Central Okanagan. The industry continues to evolve and entertainment is frequently paired with the natural beauty of Okanagan offerings, such as Shakespearean products at Mission Hill Family Estate Winery and, “Mozart in the Park,” classical music performed lakeside in Kelowna’s City Park. The Rotary Arts Centre, in the heart of Kelowna’s Cultural District, opened in the fall of 2002. This multi-purpose facility accommodates a wide range of performances and resident artists can also be watched while they work. Historical attractions such as the BC Orchard Industry Museum and Wine Museum in Kelowna, showcase the agriculture history of the area in authentically restored buildings. Numerous galleries feature the work of local artists and festivals and events are held throughout the year. The Spring and Fall Okanagan Wine Festivals held in May and October have become major tourism draws for visitors throughout North America. CHECK OUT THE ACTIVITIES YOU CAN DO AROUND KELOWNA'S DOWNTOWN WATERFRONT!